The mechanical behavior of a material defines the relation between deformation and stress. The thermo-mechanical behavior of a material defines this deformation-stress relation for varying temperature conditions in the material. The complexity of thermo-mechanical problems stems from the tight coupling between the mechanical and thermal fields. Failure of a material is defined as the loss of load bearing capacity of the material (by cracking, tearing or mechanical instability). The study of mechanics and/or thermo-mechanics and failure of engineering materials (metals, ceramics, rubber) is vital to the fields of aero-space, automobile and nuclear industry, to name a few. In addition, a reliable quantification of the mechanics of biological soft tissue (skin, arteries) and hard tissue (bones) is crucial to the field of bio-mechanics which develops artificial implants, stents and other mechanical devices which interact with the human body. Study of cold and hot metal forming processes (Upsetting, Rolling, Extrusion). 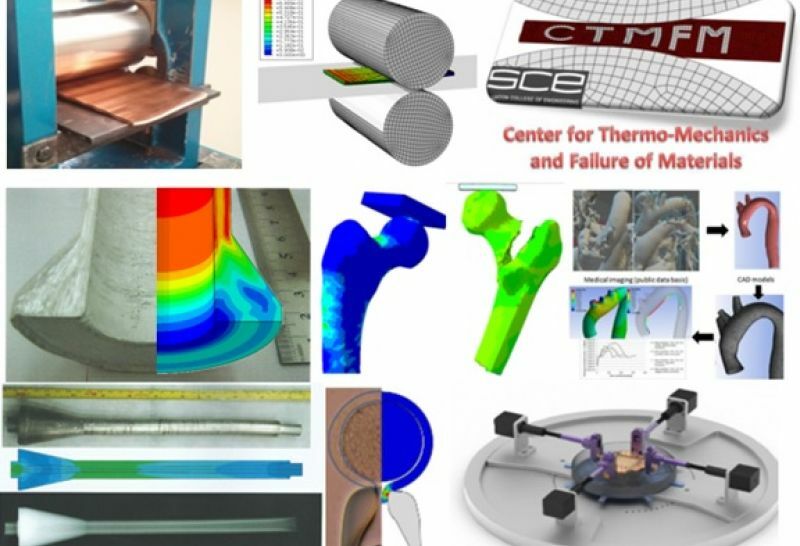 The center utilizes advanced numerical tools (low order and high order finite elements) and designed experiments to develop mathematical models for implementation in the finite element framework. The computational tools enable prediction of deformation and failure as well as the study of engineering and biological materials under various loading conditions and temperatures. Emphasis is placed on the relation between the mechanical and thermal fields which develop on the macro-level and microstructural aspects (such as grain size and texture in metals and fiber orientation and layered structure in biological materials). Research in the center is conducted in collaboration with several other academic institutions, Industry, National labs and Hospitals.